The ProForm Performance 600i is one of ProForm’s budget treadmills. It has some of ProForm’s signature features like the brand’s ProShox(™) cushioning, a roomy belt measuring 20” by 60”, and a core-positioned fan. However, the Performance 600i is a cheaper treadmill, so it doesn’t have as many features as you may find in a more expensive ProForm treadmill. As long as you keep in mind that the Performance 600i won’t be as fully kitted out like a more expensive treadmill, it is a good, affordable treadmill option. The Performance 600i is often marked down to $799. 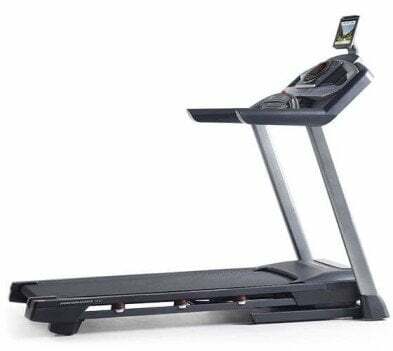 Plan on only walking and jogging - The Performance 600i is a good treadmill but with a 2.75 CHP motor, it is not up for much extended use while running. Users who want to primarily walk, and jog occasionally, would be best suited for Performance 600i. Are on a budget - When you want a good treadmill from a reliable treadmill brand, it can be discouraging if you are on a budget. The Performance 600i bridges the gap between budget restrictions and top treadmill brands. Want a basic console - The console on the Performance 600i is fairly easy to navigate and would be great for users who want a simple console on their treadmill. For a fairly cheap treadmill, the Performance 600i does a few things well. Decent incline range - With an incline range of 0% to 12%, the Performance 600i outdoes the competing NordicTrack C700. However, the F63 is in the Performance 600i price range and can incline up to 15%. Plenty of programs - The Performance 600i comes with 22 workout programs for users to choose from, which is more than other treadmills in its price range. Adequate cushioning - ProShox™ cushioning comes with the Performance 600i. This is the same kind of quality cushioning ProForm’s more expensive treadmills come equipped with, though there is less of it than on other models. Overall, the Performance 600i is an affordable treadmill and a good option if you are looking for a treadmill while on a tight budget. Footprint In Use (W, L, H): 36.75" x 79.75" x 59.25"
Motor Size - The motor on the Performance 600i is 2.75 CHP. Treadmill motor size affects sound output and longevity. So with its somewhat small motor, the Performance 600i runs pretty quietly. It also transitioned well between inclines. But the smaller motor size is something to be cautious of if you plan on running frequently on this machine. Running Area - Measuring 20” wide by 60” long, the running area of the Performance 600i is roomier than other budget treadmills like the C700, which is only 20” by 55”. Weight Capacity - The Performance 600i has a weight capacity of 325 lbs. As a fairly lightweight treadmill, we are not sure it can really accommodate a user of that weight. If you have concerns, SOLE’s F65 can hold a user weighing up to 350 lbs anf feels a bit sturdier when in use. Folding - This treadmill can fold up easily, thanks in part to its EasyLift(™) Assist hydraulic system. With this system, you can raise and lower the deck with a fraction of the effort it takes with another treadmill. Space / Footprint - When looking for an affordable treadmill, space usually is a consideration. The Performance 600i measures 36.75" wide, 79.75" long, and 59.25" high. It is a compact treadmill with those measurements. Max Speed - The Performance 600i can reach a max speed of 12 MPH. This is a standard speed for most treadmills in any price range. Incline - This treadmill has an incline that ranges from 0% to 12%. Workout Apps - The Performance 600i has two categories which their workout apps are split by: tempo and interval. There are 11 of each type of workout, and you will have to scroll through them to pick a workout. No information is shown about the workout before you start, so there is no way to tell which programs are for beginners and which are better for people with advanced fitness levels. Display - The actual screen on the Performance 600i measures 3” by 1.5”. However, the display as incorporates LED lights around the display, blending the LCD screen with the round display face. The LED lights will show whether you are working out at endurance, tempo or peak performance. Speakers - There are two, 2” speakers embedded on either side of the display. These speakers are okay quality. While the sound is pretty clear up to the mid-range volume, the sound loses quality at you turn up the volume. It also becomes progressively more tinny sounding. Fans - There is one fan mounted under the console. It is positioned so cool air will hit the user’s core. Since this is where most people retain heat as they workout, it is an excellent position to have a fan. Heart Rate Monitoring - There are only EKG handlebar grips for heart rate monitoring on the Performance 600i. The Performance 600i has a light metal frame. It is clearly not as sturdy as the F63, and it lacks a crossbar. This causes the frame connected to the console to wiggle when users run on the Performance 600i. However, walking and light jogging does not trigger movement. Textured and slanted sides make up the side rails of the Performance 600i. The slant is a bit unnerving since it is possible you may catch your foot on the moving belt while standing on the side rails. But the texture on the rails does help prevent any slipping. There are three ways you can reach ProForm customer support: phone, email, and live chat on their website. You can utilize these if you run into any problems with your ProForm treadmill. If you want to return your Performance 600i, you have 30 days where you can return the treadmill and receive all your money back, minus a 10% restocking fee. If your treadmill is received damaged or defective, you do not have to pay the restocking fee. So if you are looking for an affordable treadmill, then the Performance 600i is a good option. Skip third-party treadmill brokers and go straight to the source for your Performance 600i. You will have an easier time receiving customer support by working directly with ProForm. They also can provide you with the most updated version of the treadmill you want. So pass over the hassle and buy the Performance 600i directly from ProForm.